Experience has shown that you can’t always rely on the British weather or even on England’s opening batsmen, but it seems you can rely on starting the stamp auction with a few substantial British Commonwealth collections. Lot 1 in the auction was offered as a valuable King George V to Queen Elizabeth II mainly mint collection in a pair of volumes and containing a wealth of better material. 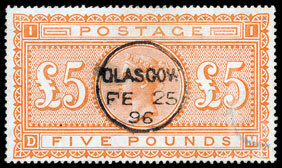 The catalogue estimate of £3,500 was quickly bid up to £4,950 including buyers' premium. Similar following lots were despatched in the same way. All of the Thematic lots in the auction sold well, including an unusual and extensive specialist collection of British & Overseas Philatelic Exhibition issues. Contained in four boxes and estimated at £400, the hammer price was an impressive £2,480. 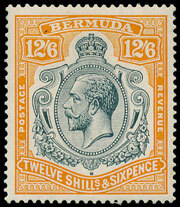 The British Commonwealth section included a series of modern errors that proved to be popular, which sold for well above estimate. 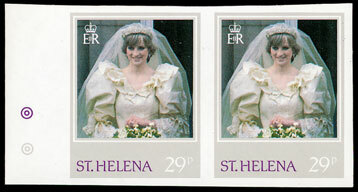 These included a BAT 1971 10p on 2/- UM with inverted watermark, Falkland Is Flowers ½p UM with inverted watermark and St Helena 1982 Diana 29p UM imperforate pair. 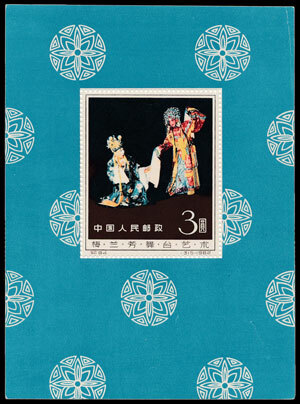 The auction included perhaps the most sought after items of modern era Chinese stamps, the 1962 Mei Lan-fang mini-sheet. 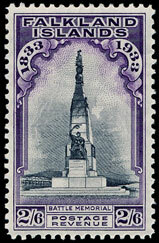 The sheet was issued in very limited numbers at a time when there were very few collectors in China. 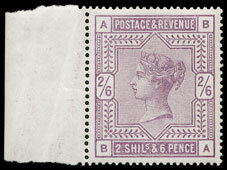 There were also severe restrictions on stamps being exported, which has resulted in this becoming a modern rarity. The sheet is estimated in SG at £22,000, and sold for £3,200 despite some faults. In the GB section, a lucky room bidder picked up an 1840 1d black with a very unusual ‘Wooton-under-Edge’ modified cancel for £570. 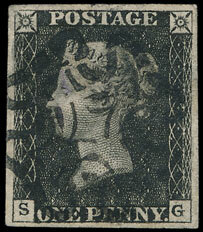 Listed in the SG specialised catalogue at £6,500 this was probably the bargain of the sale. An 1867-83 £5 orange with a very impressive central cds strike sold for £1,400, and an 1883-4 2/6d UM sold for over half of the catalogue price at £310.